The high school seniors, all children of TimkenSteel Corporation employees, will use the funds for the academic pursuit of their choice at any accredited university. They participated in a competitive application process which was open to employees' children around the world and based upon academic and extracurricular achievement. "We have some of the most knowledgeable people in the industry working at TimkenSteel, and many have smart kids with tremendous potential. TimkenSteel scholarships fuel their dreams and, for the top award winners, may even open new educational possibilities," said Elaine Russell Reolfi, executive vice president at TimkenSteel and president of the company's charitable fund. She and other company leaders travelled to the winners' high schools to present the scholarships. 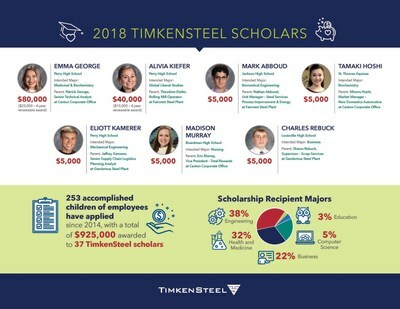 "These four young women and three young men who make up the 2018 class of TimkenSteel scholars are accomplished leaders, and we're proud to support their educational future." The TimkenSteel Charitable Fund launched in 2014 when TimkenSteel Corporation (NYSE: TMST, timkensteel.com), a leader in customized alloy steel products and services, became an independent company. The steelmaker's tradition of awarding scholarships to employees' children dates to 1958. 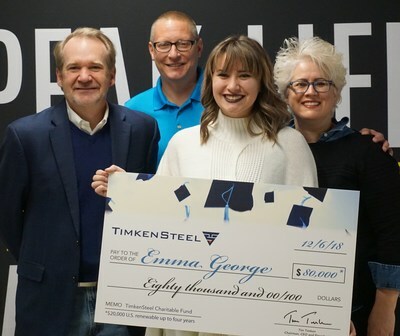 Tim Timken, TimkenSteel chairman, CEO and president, was on hand at Perry High School in Massillon, Ohio, to present the top award to Emma George, the daughter of Patrick George, senior technical analyst at TimkenSteel's Canton corporate office. The high school senior earned a $20,000 scholarship, renewable for up to three additional years and a total of $80,000. She plans to study medicinal and biological chemistry. Alivia Kiefer, the daughter of Theodore Kiefer, rolling mill operator at TimkenSteel's Faircrest Steel Plant in Canton, received a $10,000 scholarship, renewable for up to three additional years and a total of $40,000. She also is a senior at Perry High School and plans to study global liberal studies. Mark Abboud, the son of Nathan Abboud, unit manager – steel services process improvement & energy at TimkenSteel's Faircrest Steel Plant. He is a senior at Jackson High School in Massillon, Ohio, and plans to study biomedical engineering. Tamaki Hoshi, the daughter of Minoru Hoshi, market manager – new domestic automotive at TimkenSteel's Canton corporate office. She is a senior at St. Thomas Aquinas High School in Louisville, Ohio, and plans to study biochemistry. Eliott Kamerer, the son of Jeffrey Kamerer, senior supply chain logistics planning analyst at TimkenSteel's Gambrinus Steel Plant. He is a senior at Perry High School in Massillon, Ohio, and plans to study mechanical engineering. Madison Murray, the daughter of Eric Murray, vice president – total rewards at TimkenSteel's Canton corporate office. She is a senior at Boardman High School in Youngstown, Ohio, and plans to study nursing. Charles Rebuck, the son of Shawn Rebuck, supervisor – scrap services at TimkenSteel's Gambrinus Steel Plant. He is a senior at Louisville High School in Louisville, Ohio, and plans to study business. TimkenSteel (NYSE:TMST, timkensteel.com) creates tailored steel products and services for demanding applications, helping customers push the bounds of what's possible within their industries. The company reaches around the world in its customers' products and leads North America in large alloy steel bars (up to 16 inches in diameter) and seamless mechanical tubing made of its special bar quality (SBQ) steel, as well as supply chain and steel services. TimkenSteel operates warehouses and sales offices in five countries and has made its steel in America for more than 100 years. The company posted sales of $1.3 billion in 2017. Follow us on Twitter @TimkenSteel and on Instagram.